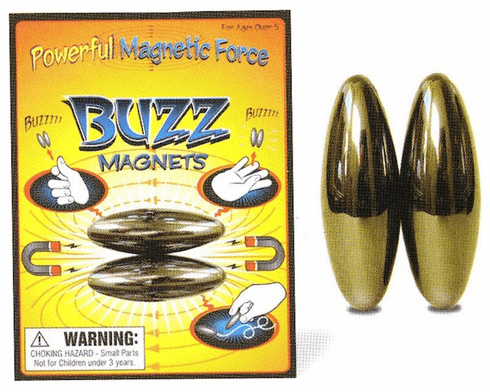 Toss the Buzz Magnets into the air. The 2 hematite magnets fly & collide, wrestling for equilibrium in a clattering, buzzing, cicada sounding collision until they land at rest, centered and quiet in your cupped hands. A pair of powerful ellipsoidal hematite magnets, their poles aligned through their narrow circumferences, allow you to demonstrate the constant striving of the magnets to stay in perfect balance with each other. Not only are they fun to play with, but they are also great for hand-eye coordination.